What should I be looking for when I am buying toys for my cat? The toys that you choose for your cat must take into account the natural behavior of the species. Often, the simple ones are the best and ones that offer unpredictable movement, rapid movement and high-pitched sound are likely to provide your cat with hours of entertainment. Rolled-up pieces of paper work very well, provided that you are on hand to move them in an unpredictable and exciting fashion. You can add to the value of this sort of play by rolling the paper down stairs or along ledges and incorporating an element of agility into the game. 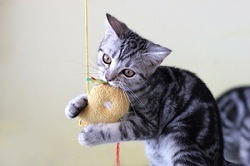 Cats also like to be able to pick their toys up, so small items are often more attractive than larger ones. If your cat appears disinterested in a toy it is possible to increase its incentive to play by attaching a tasty treat. You can also increase the variety of the “prey” that you offer by attaching different items onto the end of the string attached to a rod for different play sessions. Cats that initially show interest in chasing a toy may quickly lose interest. However, this may not be an indication that the play session is over, but rather that the novelty of the specific toy has worn off. In fact, for some of these cats, the play intensity might be heightened and stopping might only lead to chasing less appropriate objects such as your hands or legs. Therefore, be certain to try at least one or two additional toys before ending the session. Should I buy catnip toys for my cat? A number of cat toys are advertised as being impregnated with catnip and this substance can make the toys very attractive. However not all cats show a reaction and indeed as much as 50% of the cat population is not responsive to the chemical which is contained in this herb. Those that react will experience a period of mild hallucination when the chemical nepetalactone acts on their brain and will show a short-lived response of excitement that borders in some individuals on euphoria. There is no harm in this response and the chemical is not addictive, so if your cat is a responder giving access to catnip can add another dimension to his life! My kitten loves to play a game that involves chasing my fingers as I run them across the back of the sofa or pouncing on my toes as I move them under the covers. Is it okay to play these games with her? Chasing and pouncing are vital elements of feline predatory behavior and your kitten will spend hours engaging in these activities. When toes and fingers move rapidly across her field of vision they are seen as a suitable target and it can be very amusing to play with your kitten in this way. However, the problem is that your kitten will learn to target human flesh within a predatory context and as she grows up you may live to regret these seemingly innocent games. As a basic rule, it is best to only play predatory games with toys that your cat can eventually catch and “kill,” such as toy mice, pieces of food on the end of string, or balls of rolled-up paper. Therefore, be certain to offer several play sessions with chase toys each day, and schedule them at times when the cat has a history of becoming most active in order to preempt other forms of undesirable chase and play. The size, texture, movement, and possibly odor of the toy can all be used to stimulate the cats interest. However, even though the cat may soon lose interest, owners should be encouraged to play with a few different toys since the novelty may quickly wear off but the cat’s interest in play may remain heightened. Interaction with human hands should be limited to the context of affection and to being stroked and petted. I have heard about cat toys that dispense food. Are these a good idea? These toys are often referred to as cat puzzle feeders and they can be a very useful way of increasing activity in sedentary or indoor cats as well as providing entertainment for food orientated individuals, who will work hard to get the treats out from inside the device. They are available in many pet shops and have varying sizes of holes that deliver food as the toy is batted or rolled. However, it is also easy to make your own from a plastic bottle, by making small holes along the sides that are just big enough to release pieces of dry cat food that are placed inside. As the cat knocks the bottle around the floor it will be rewarded with pieces of food and the fact that the bottle is transparent and makes a noise as it moves will help to keep the cat’s interest. It is also useful to use small soft plastic bottles, which are easy for the cat to pick up and carry around, as this appears to increase their level of attraction in feline eyes! My neighbor has bought her cat an aerobic center. Would you recommend one of these for my indoor cat? Over recent years there has been a trend toward the use of cat aerobic centers and these can be very good value. They incorporate the opportunity to climb, balance and scratch and many of them have small toys suspended from them, which offer the opportunity to practice predatory skills. Providing an outlet for these sorts of behavior is essential for an indoor cat such as yours, but even when a cat has access to outdoors it can benefit enormously from this sort of equipment. There are also a number of motorized cat toys and cat puzzles that might keep cats interested in the chase and predation sequence when you are not around. 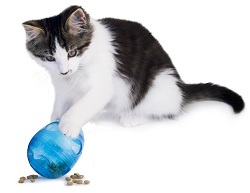 More information is available in (26) Enrichment for Indoor Cats. 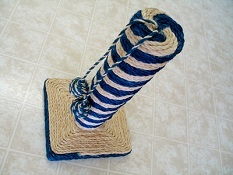 What is a scratching post, and why is it important? Scratching posts do provide an opportunity for play but they are also very necessary since scratching is an important behavior for cats and one that needs to have an acceptable outlet within the home. Probably the most important features of a scratching post are its height, its stability, and its surface texture. Tall posts allow cats to scratch at full stretch and the surface material needs to offer a good purchase for the claws. Wooden scratching facilities can help to transfer scratching behavior into an outdoor context. If your cat is destined for an indoor life you need to avoid future confusion by ensuring that the material on the scratch post does not resemble any of your household furnishings. When my cat was a kitten, I played with her every day, but surely as an adult these playtimes are no longer necessary? It is a common misconception that cats only play when they are kittens, when in fact adult cats also benefit from regular playtimes and playful interaction with their owners. 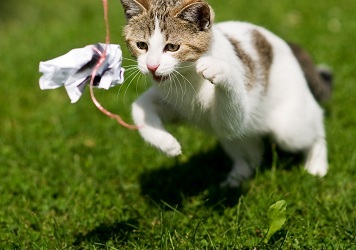 As they get older, their play may alter, but the drive to chase, pounce, and kill remains throughout the cat’s life and games that allow for these behaviors are always popular. When should I play with my cat? The best time to play with a cat is when it appears to be naturally interested. Predatory activity will naturally occur around dawn and dusk so morning and evening playtimes are likely to be the most successful. Sessions can be varied in length depending on each individual cat’s interest but in general terms a number of short playtimes of a few different toys over 10 to 15 minutes will help maintain novelty and keep the cats attention. What is the best way for me to play with my adult cat? Playing with cats using remote style toys has a number of advantages especially for the more independent adult cat. 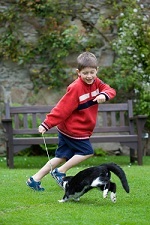 If a toy is being held in the owner’s hand the cat will be aware of their presence and this can interfere with the full expression of their predatory behavior, as it does not seem “real.” The close presence of human hands can also encourage cats to “play” with moving fingers and can encourage predatory responses towards owners’ hands and ankles. The easiest way to encourage play while remaining a little distant from the cat is to use fishing rod style toys and the aim is to keep the object moving and let the cat repetitively stalk, chase and “kill” the prey. During a natural hunting sequence cats will often spend time observing the movement of potential “prey” without chasing it and while many owners interpret this as a sign that the cat is not interested in the toy the truth is that this cat has just become more efficient at waiting for the right moment to pounce. I have given my cat lots of toys, but he only seems to play for very short periods of time and then gets bored. Is this normal? Although cats are naturally playful creatures they are also designed for short bursts of intense physical activity interspersed with long periods of sleep. This means that short intense play sessions are the most beneficial in feline terms and owners often misinterpret the lack of staying power as a sign of boredom. In fact your cat’s play pattern is perfectly normal and you can maximize the benefit of these short playtimes by rotating the toys on a regular basis and ensuring that there is always something new and exciting to keep your cat’s interest!